Tulcea County is located in Dobrogea in the south – eastern part of Romania with its residence town bearing the same name. In Tulcea County there are two nature reserves that are very different but spectacular. The Danube Delta Biosphere Reserve, located mostly in Romania, is well known worldwide, thanks to its spectacular biodiversity and landscapes. The Delta is one of the best preserved places and it is the second largest in Europe, comprising of 23 national park reserves. Wild, natural landscape enthusiasts find here a paradise that hosts countless species of plants, birds and animals. The area is ideal for boating, water sports, fishing, and nice photos. On the other hand, Măcin Mountains and the National Park with the same name, is a natural area that is very attractive. The Măcin Mountains are considered to be the oldest in Romania, dating back more than 300 million years ago. The natural park includes cliffs both isolated and groups and blocks of rocks with strange shapes. There is also a biodiversity of plants and animals threatened with extinction that are specific to this area. Danube flows in to the Black Sea at Sulina. This is the easternmost point of the country and one of the most important ports in Romania. It is unique in its own way since it is a sea port and a Danube port. The area is a unique and spectacular, a combination of reeds, water and narrow strips of sand, being very appreciated for its landscape. Beaches, lighthouses, and former European Danube Commission Palaces but also the numerous boat trips on Danube channels, make Sulina a powerful tourist attraction center. 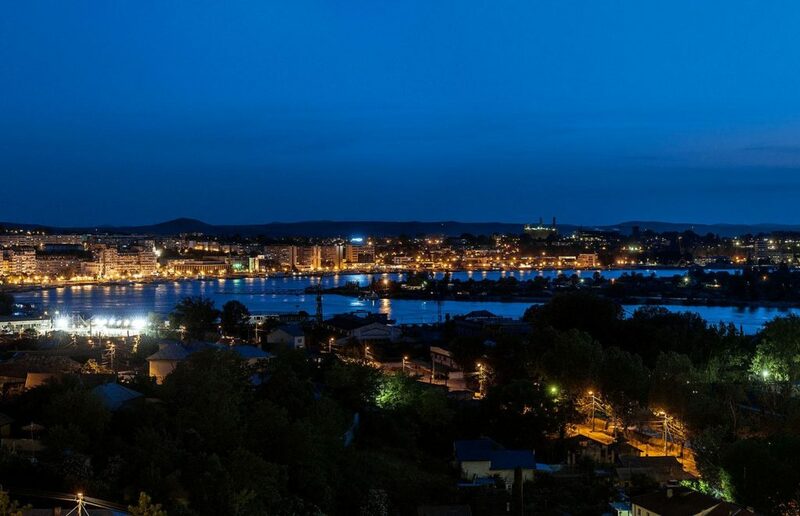 Situated on 7 hills, Tulcea is a Danube port, attested in 1506. – Aegyssus fortress located on Monument Hill, east of the city. The fortress is believed to have Celtic origins and was built in the IVth century BC. – Independence Monument, dedicated to the War of Independence of 1877 is also located on Monument Hill and it has beautiful view over the city. Built in the late thirteenth century, by the Byzantine commercial powers, fortress Enisala from Sarichiol was the only medieval fortress in Dobrogea. It was also known as Heraclia or Heracleea. Over time, some of the city was rebuilt, but currently, only a couple of walls and a tower, still exist. In Babadag there are two buildings representative of Turkish architectural style. – Casa Panagia, headquarters of Eastern Art Exhibition that includes many objects like traditional Turkish jewelry, dishes, fabric, embroidery, and clothes. -The Turkish Geamia, a historical and religious site, is thought to be the oldest Muslim architectural monument in Romania, dating from the Middle Ages. There is a Memorial House of Romanian poet Panait Cerna in the town. Besides the memorial exhibition dedicated to the poet, one of the rooms inside the house was reconstructed in the specific traditional style of the area. In addition, there is a small outdoor exhibition, presenting more agricultural tools. Orthodox monasteries: Vovidenia (XVIIth century) from Slava Cercheza, Uspenia (XVIIth century) of Slava Rusa, Celic Dere (XIXth century) in Cilicului Valley, Cocoş (XIXth century) next Niculiţel, Saon (XIXth century) in Cilicului Valley, Valea Teilor (2007) and Hermitage Sfântul Atanasie (XXIth century) the only monastery located in the Danube Delta.